One of the interesting ways to measure a design is looking at how it makes participants feel and what words they associate with it. A simple way to test for this on the UsabilityHub platform is using the Microsoft Product Reaction Cards, named for a desirability study first developed by Microsoft in 2002. 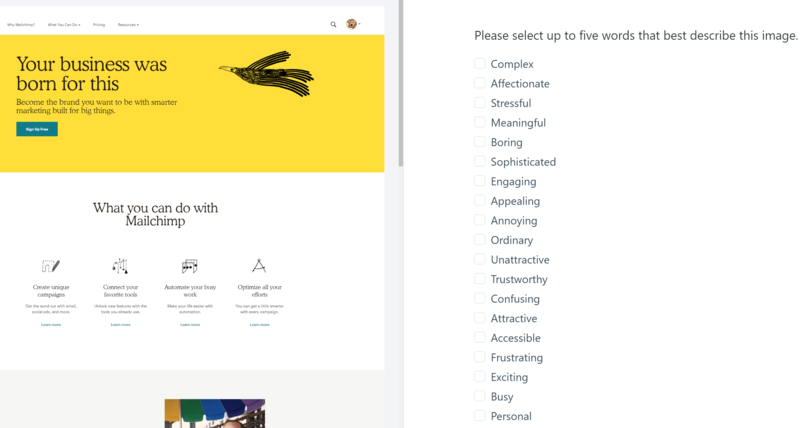 The method is simple: choose 15-25 relevant words from the full list and load them into a design survey question. Instruct participants to look at your design next to the list of words, and to pick up to five words that best describe how they feel about the design. The output from this kind of study is a count of the most popular words chosen by participants. There’s little to no interpretation of the results required; if the words that come back are what your branding is going for, then you’ve hit the mark! Testing in this fashion can be very useful when redesigning the branding of a service. Running the same test with an older version of the branding can give you insight into how users interpret your new direction. In addition to branding exercises, you can use this method to test phone and web app UIs, copy, marketing images, and much more. Just don’t forget to tailor your list of words to the material that you’re testing.